Soyinka said this in Abuja on Wednesday at a symposium on fake news organised by BBC News. The playwright, who was a panellist at the event tagged, ‘Nigeria 2019: Countering Fake News,’ urged the traditional media not to act like the electronic media by spreading unfounded allegations. 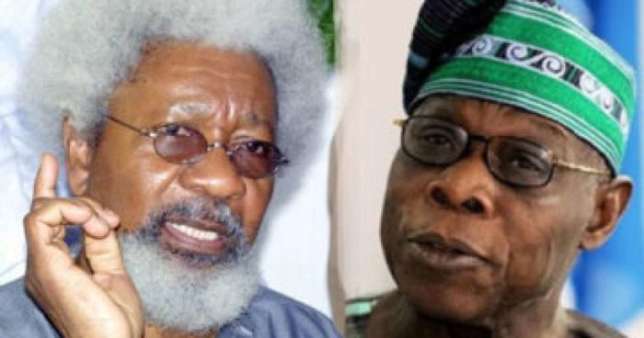 Reflecting on the effect of fake news ahead of next month’s elections, Soyinka asked Nigerians to be wary of a former President who pretends to be the conscience of the nation. The Nobel laureate said if the former leader had been referring to a certain person for eight years as a devil and is now telling Nigerians to vote for the devil, then there was reason for Nigerians to express some doubt. Although he did not mention the former President he was referring to, the only President who has ruled Nigeria for only eight years is Olusegun Obasanjo, while the Presidential candidate of the Peoples Democratic Party in the 2019 polls, Atiku Abubakar, could be the ‘devil’ that Soyinka was referring to. Obasanjo until recently had described Atiku as very corrupt even going to the extent of dedicating some parts of his published works to lambast the ex-VP. He said God would not forgive him if he supported Atiku’s presidential bid.